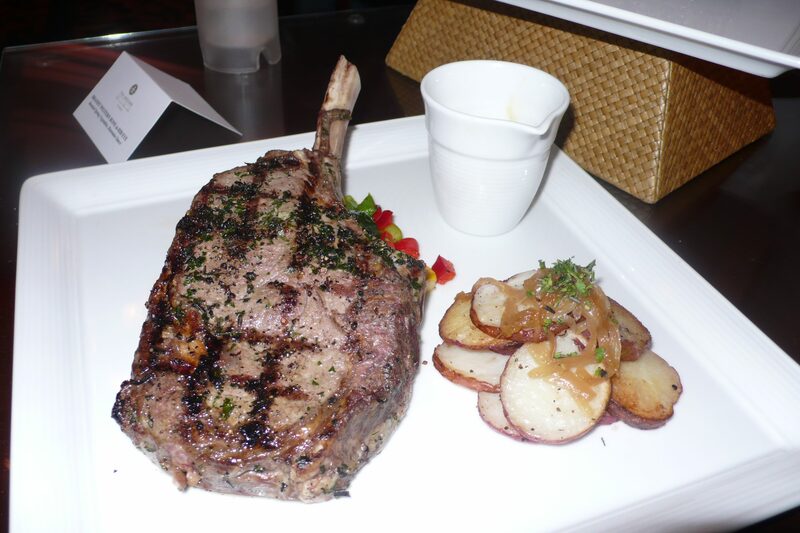 For the past few nights it has been cold and rainy in LA and the perfect weather for a hearty and satisfying dinner. 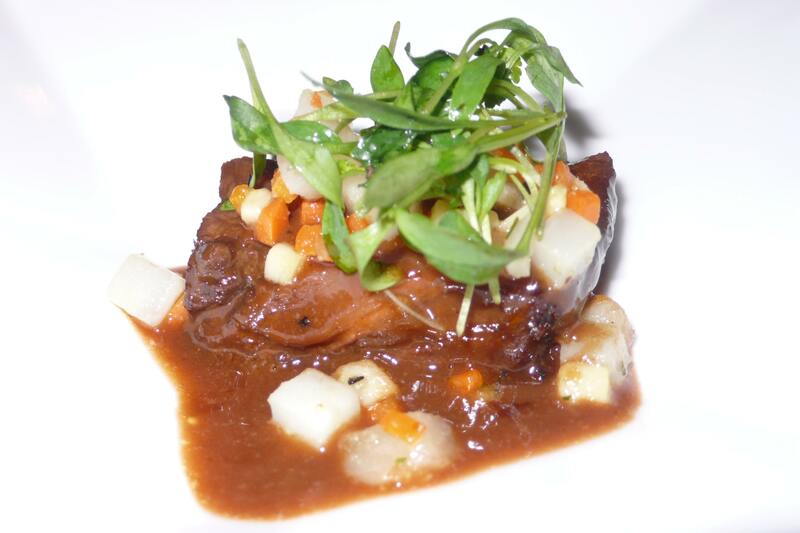 After trying many recipes for short ribs, I think this one stands out as the best. I paired it with mom’s recipe for garlic mashed potatoes. Heat the olive oil in a large Dutch oven. Add the thyme to infuse the oil. 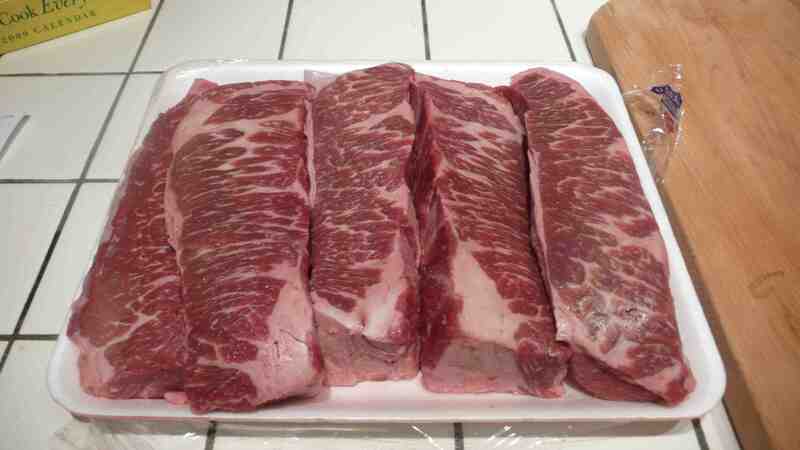 Cut the short ribs into 2 inch pieces and salt and pepper all sides. Put the cubed meat in the dutch oven and sear on all sides. 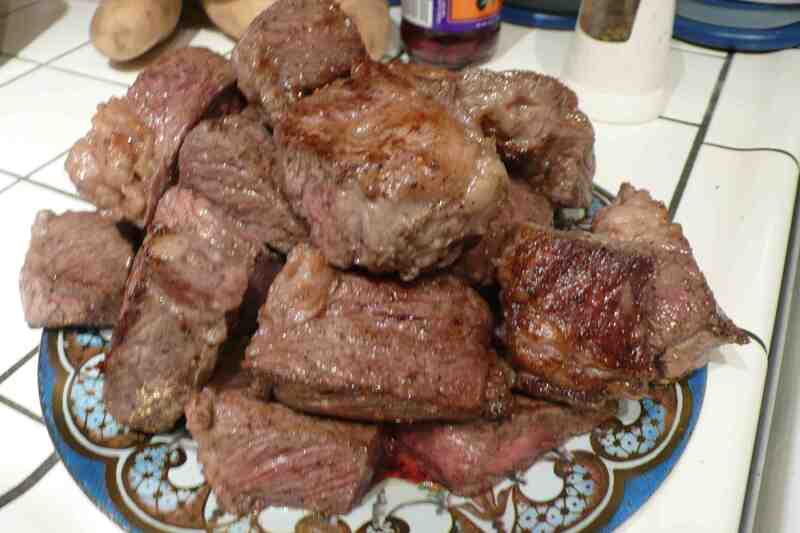 Remove and put them on a plate for future use. 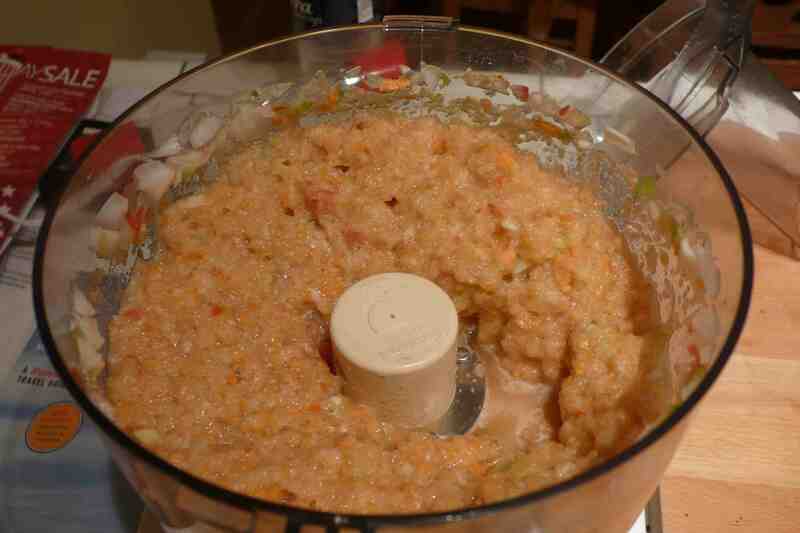 Place the onion, garlic, celery, carrot, and tomato into a food processor and blend into a smooth pulp. 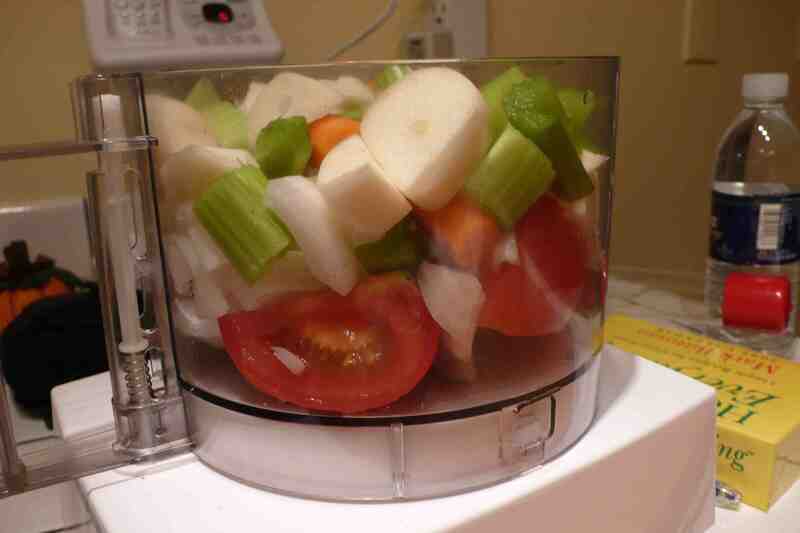 This looks a bit strange but it will taste great later on. Add the vegetable pulp to the dutch oven and season with salt and pepper. Cook for five minutes. Pour in the red wine and beef stock and bring to a boil. 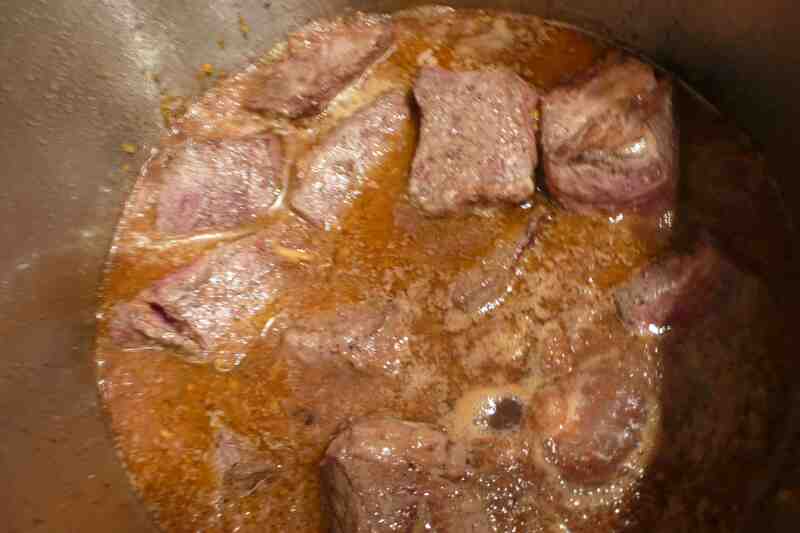 Place braised ribs into the dutch oven evenly throughout the sauce and reduce the heat to a simmer. Simmer 2 1/2 hours until meat is tender. I cover the dutch oven with a lid. Wrap head of garlic in aluminum foil and roast in a 350 degree oven for 45 minutes. 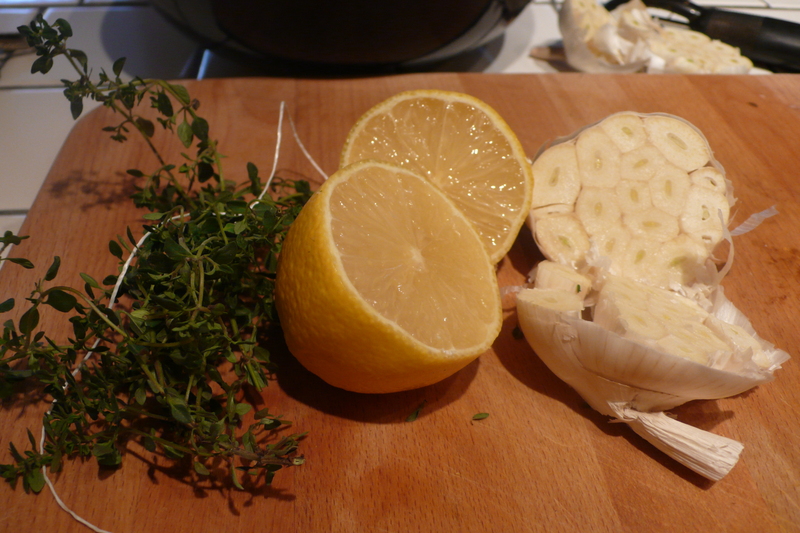 When cool, unwrap and squeeze our garlic and reserve. 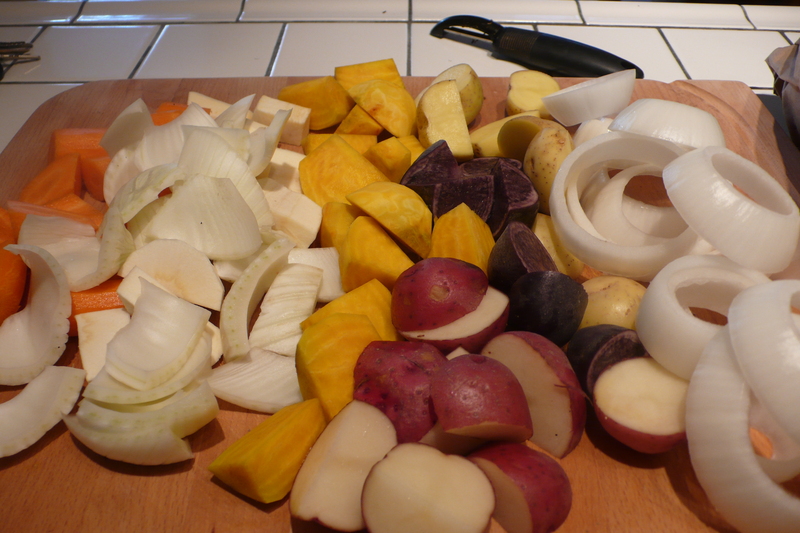 Peel and chop potatoes. 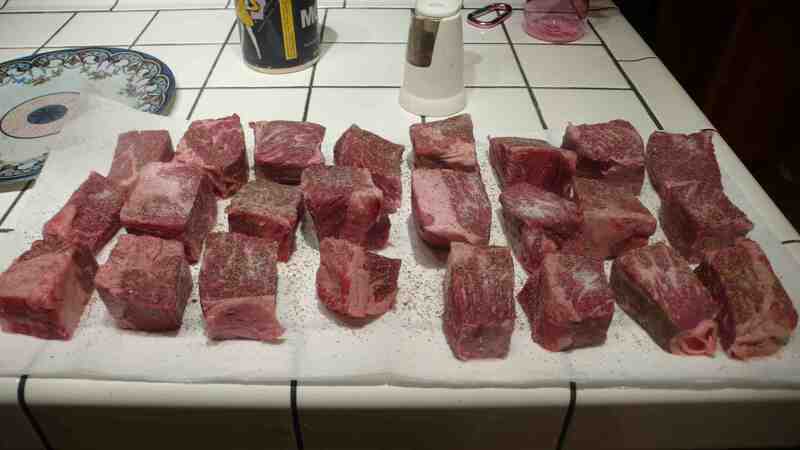 Put pieces in a pot of boiling hot water and sprinkle with garlic salt. Boil potatoes until ready to mash. Drain potatoes, turn off heat and return potatoes to pot. 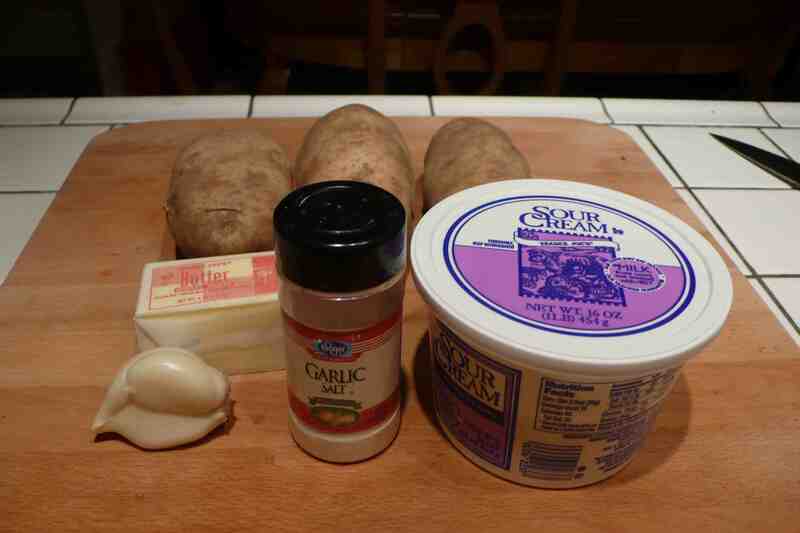 Add roasted garlic, sour cream, and butter, and mash! 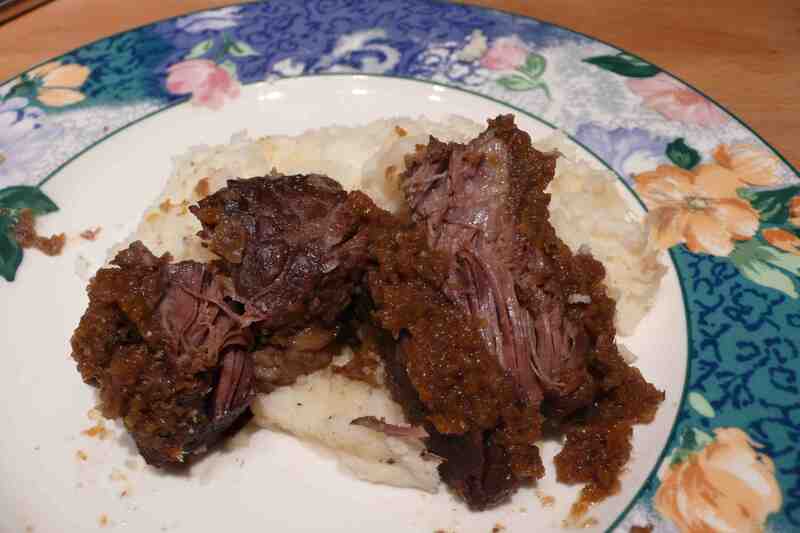 Plate mashed potatoes and top with short ribs and sauce. Enjoy! 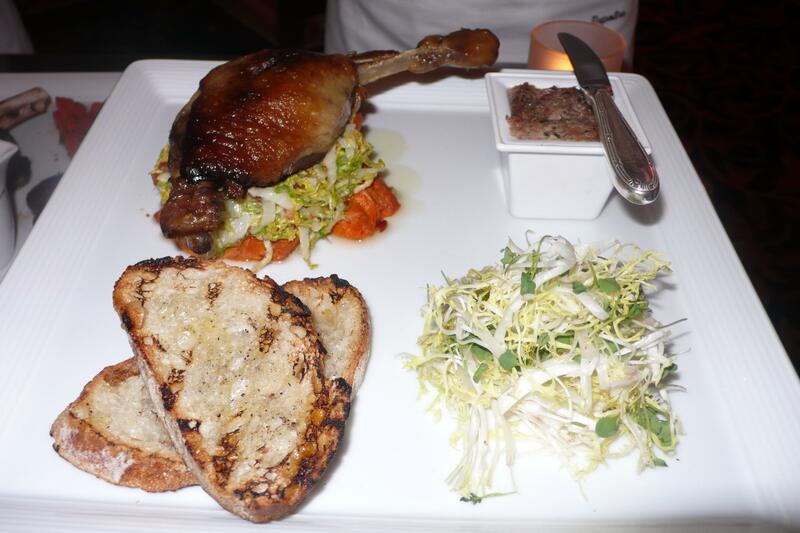 Last Thursday evening the Langham Huntington Hotel and Spa held a press event to introduce their new California-bistro style menu for the Terrace restaurant. 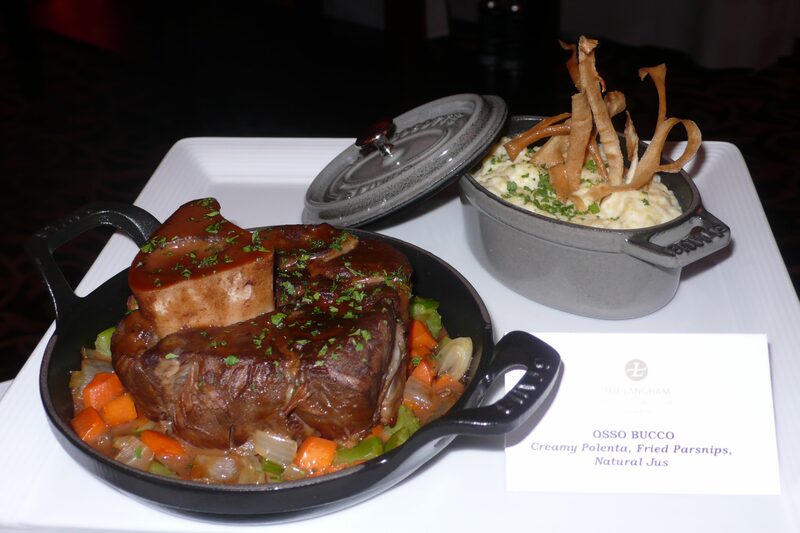 Chef de Cuisine Loren Lawe, along with the guidance of Executive Chef Denis Depoitre and Executive Sous Chef Christophe Pellier, created the menu with the intention of bringing new flavors to the hotel and the community. 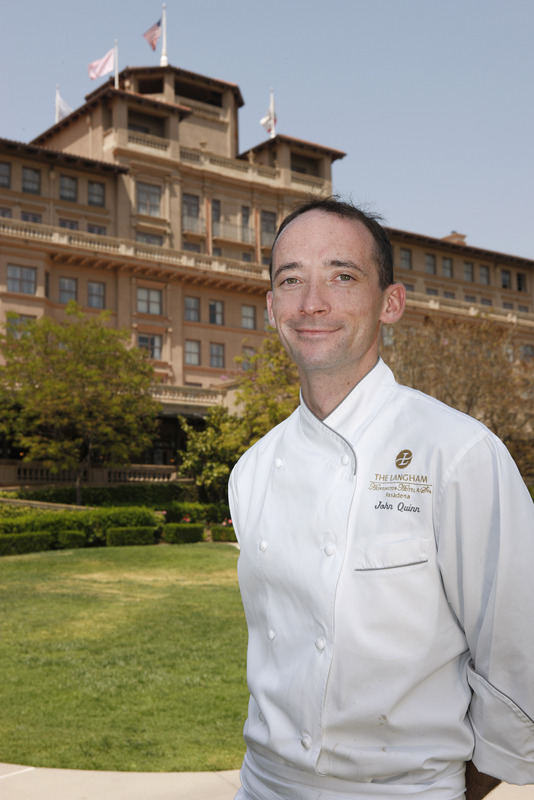 Pastry Chef John Quinn created the dessert menu. 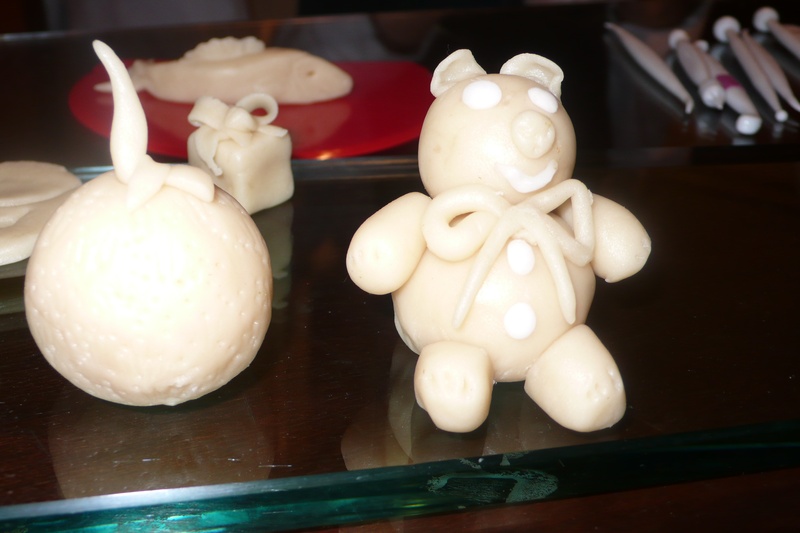 Pastry chef John Quinn showed us how to make sculpted marzipan desserts, here is our favorite – the teddy bear. 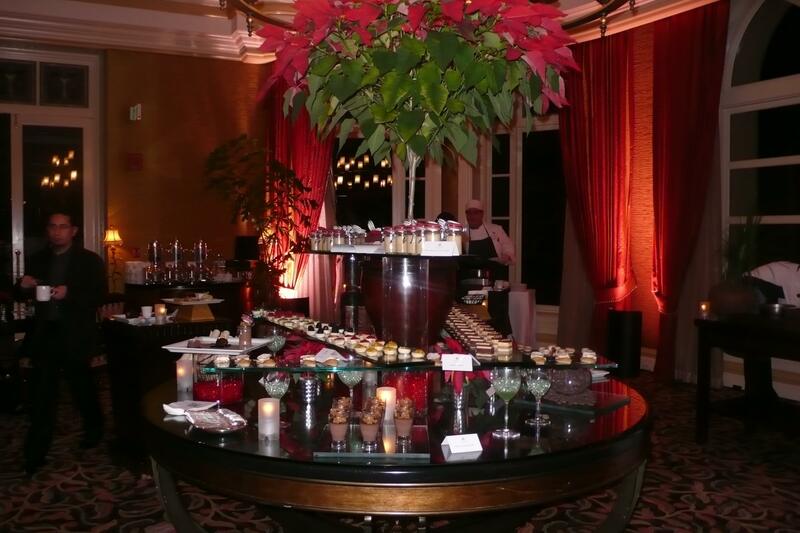 Chef Quinn also created dozens of delicious and beautiful desserts, below is the stunning dessert table. 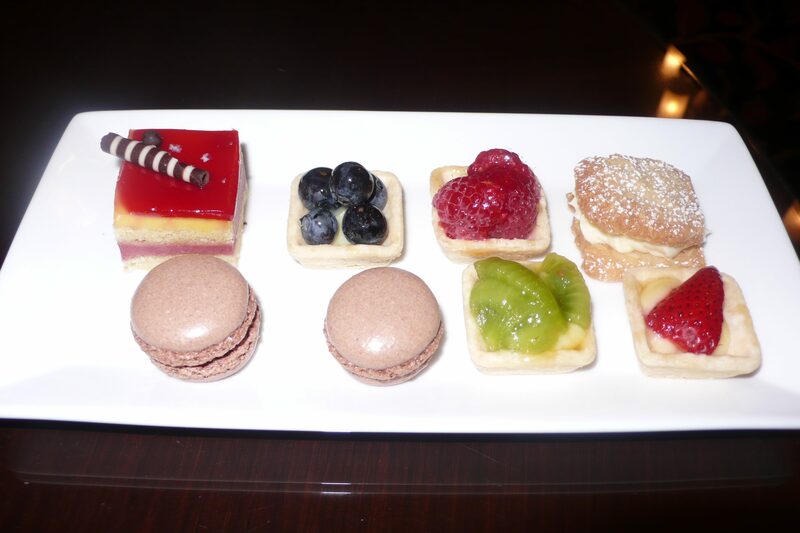 My friend Dalbert (seen above getting tea to the left of the table) and I selected these tasty treats to sample. 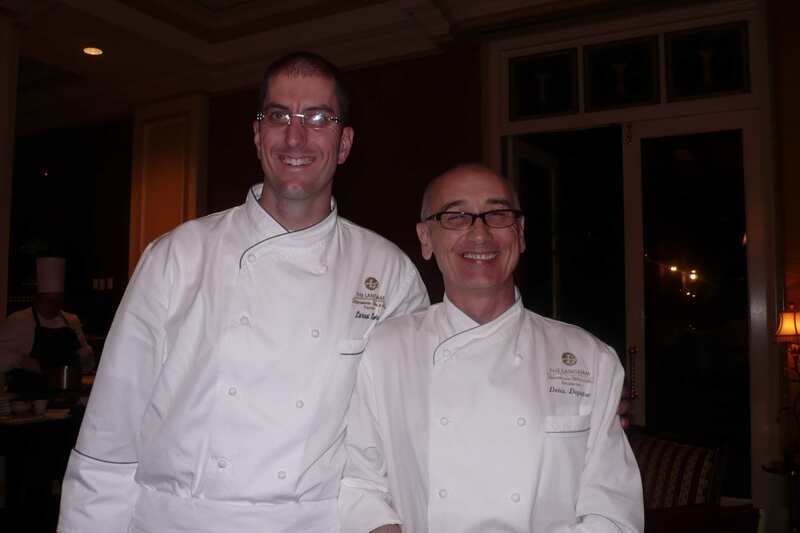 You can listen to a short interview with chefs Lawe and Quinn on the interview link. 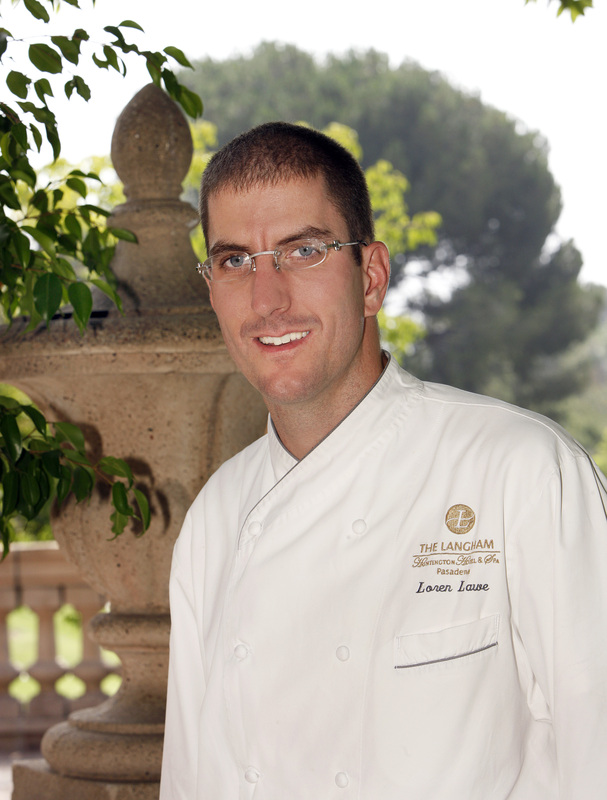 I spoke with Langham Huntington Hotel and Spa Chef Loren Lawe and Pastry Chef John Quinn about the new menu they created for the Terrace restaurant at the Langham. 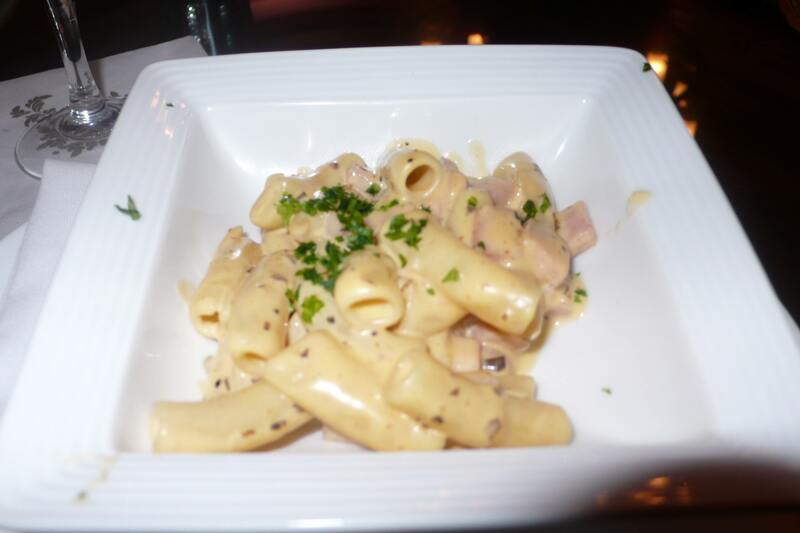 The menu features California-bistro style upscale comfort food. When the days grow shorter and colder I begin to want to cook more comfort foods. 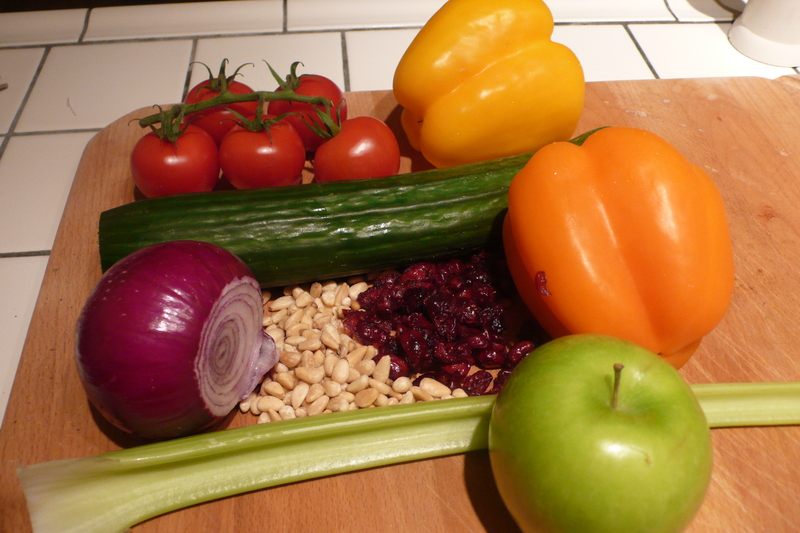 I usually eat out two or three times a week and often do not have the time to make a satisfying winter dinner. On Sundays when I have a few afternoon hours free I head to the kitchen to make some standard classics. 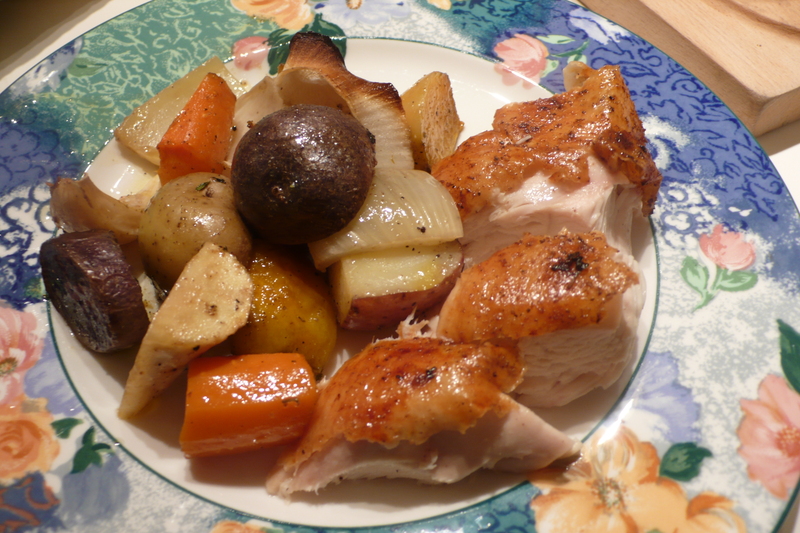 Here is a recipe I made last night for a simple and delicious roast chicken, with pics. Preheat oven to 425 degrees. 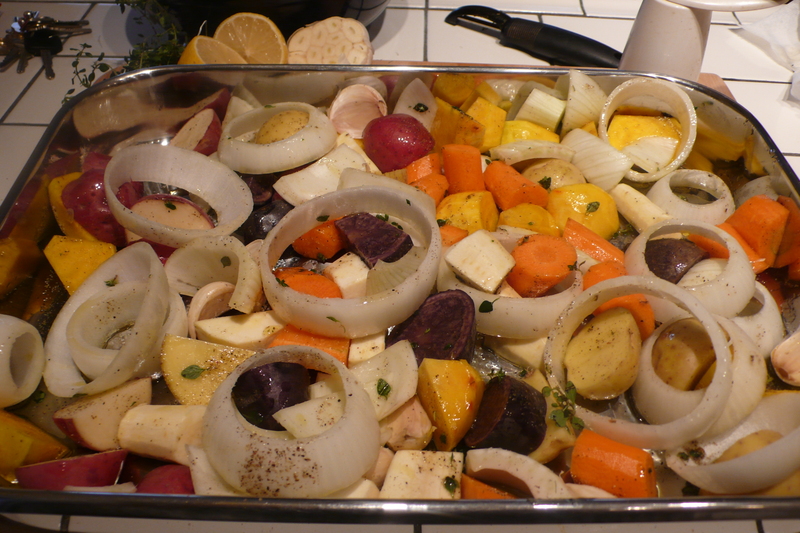 Cut up onions, potatoes, beets, carrots and parsnips (peel these last three) and put them into the bottom of the roasting pan. 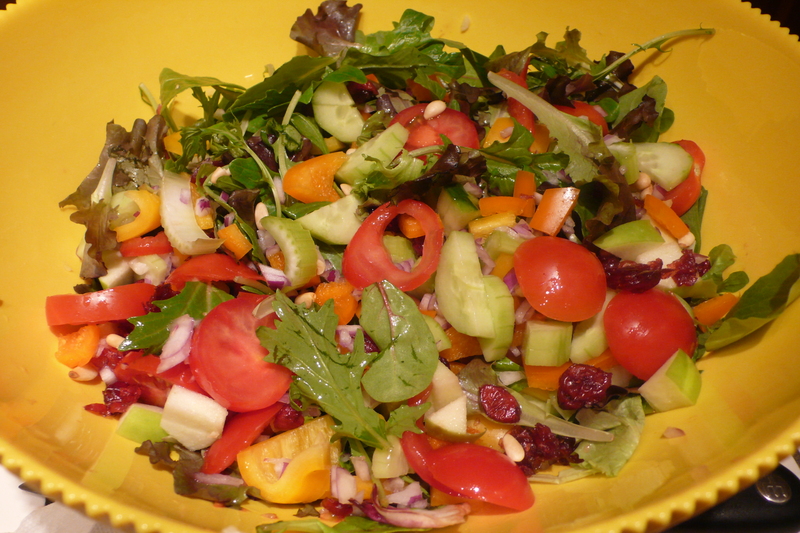 Chop up a few sprigs of the time, add olive oil and salt and pepper and mix together. 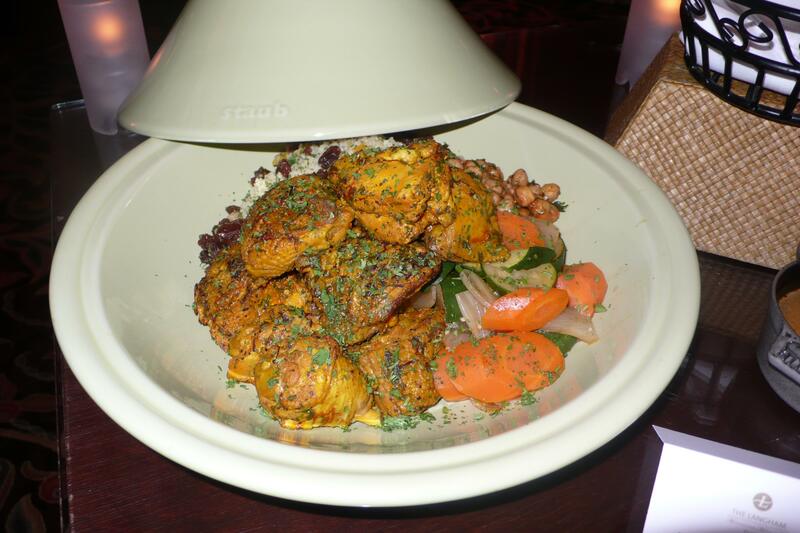 Unwrap chicken and take out giblet bag (don’t forget to do this!). 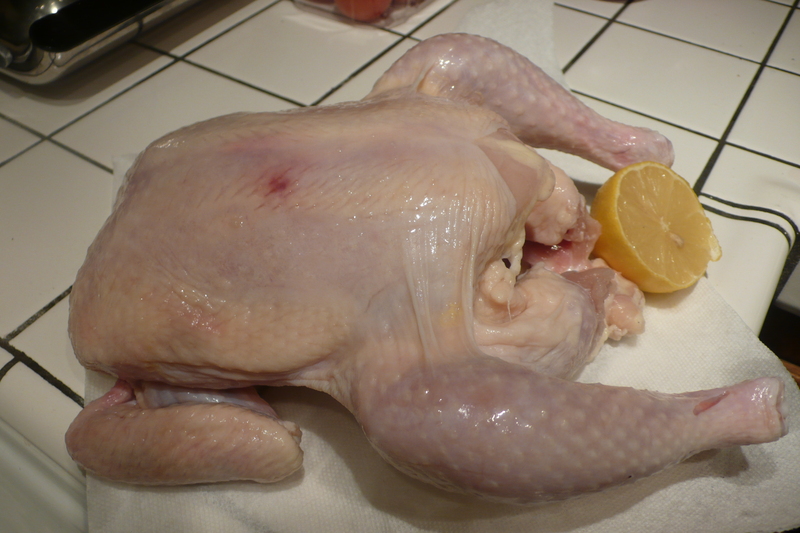 Wash chicken well inside and out and rub with 1/2 cut lemon. Salt and pepper entire chicken, don’t forget the inside. Stuff chicken with thyme (wrap thyme with butcher string into bundle), 1/2 lemon, and cut garlic (cut whole garlic head in half and stuff it into the inside of the chicken (it’s okay to keep the peel on)). After stuffing with thyme, lemon and garlic, tie chicken legs together with butcher string. 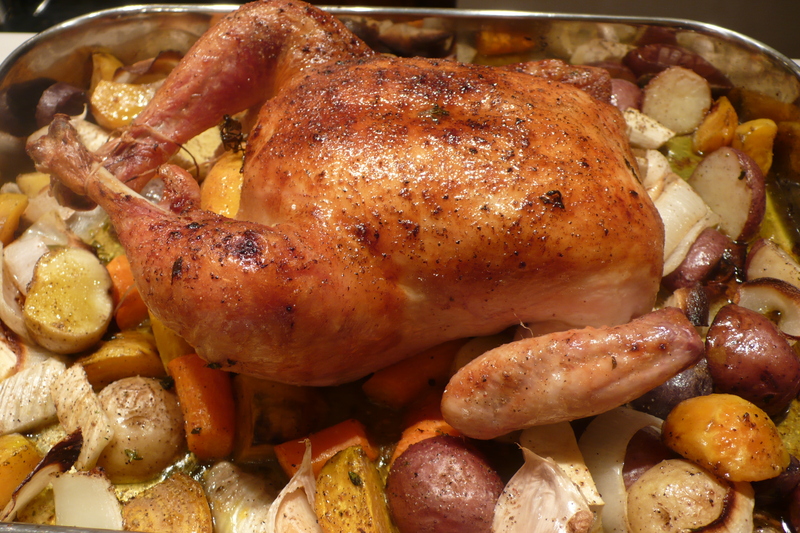 Place chicken on vegetables in the roasting pan. Heat three tablespoons butter in the microwave and when done pour over chicken. 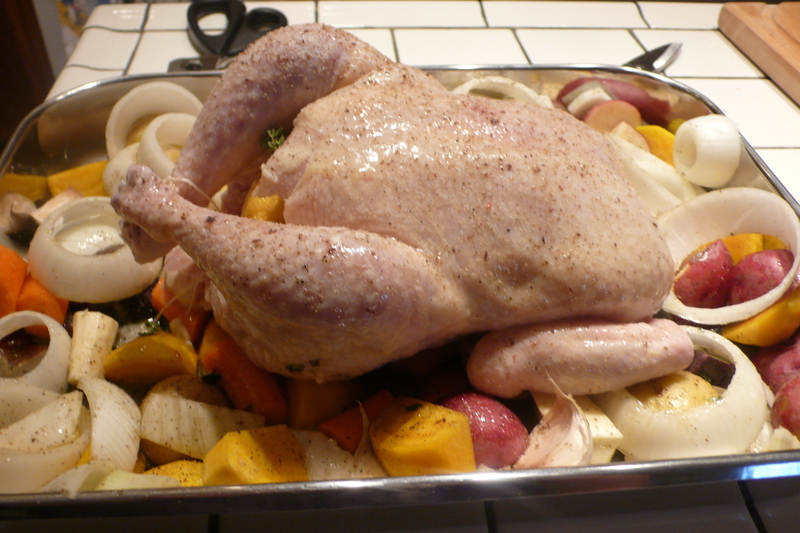 Put chicken into oven and roast for 1 1/2 hours, making sure to baste every 1/2 hour. After taking chicken out of oven let it rest for 15 minutes so the juices redistribute. Carve and enjoy!